Jr. Sumo Suits Perfect for junior sumo wrestlers. Kids can sumo each other in these padded suits to see who wins the Ultimate Sumo Wrestler challenge. Great for team building, church and school events. Fits people 4’4” to5’2”.. Jr. Sumo Suits Perfect for junior sumo wrestlers. 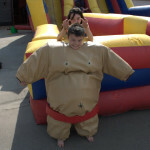 Kids can sumo each other in these padded suits to see who wins the Ultimate Sumo Wrestler challenge. Great for team building, church and school events. Fits people 4’4” to5’2”.